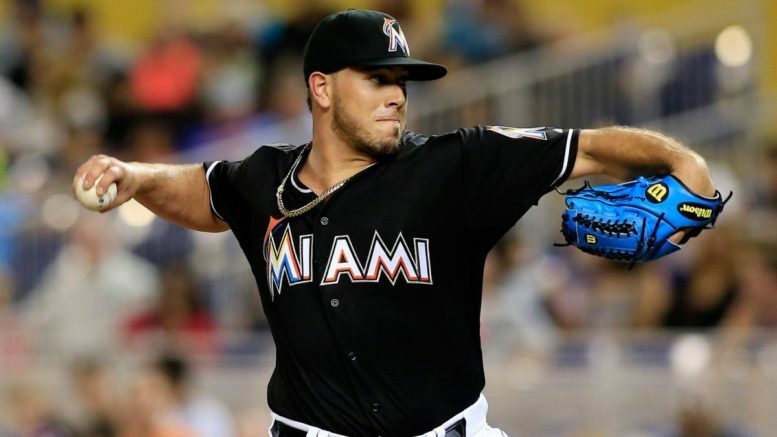 Jose Fernandez could be a difference-maker for the Marlins in a one-game wild card playoff game. What are your feelings on the wild card one-game playoff? It’s a half-decade old now, and there are mixed feelings. I personally can’t say it’s a bad thing, although I would be in favor of shortening the regular season by a few games and turning it into a best-of-three series. It would be travel-heavy, with a 1-1-1 format being the only fair way to set it up, but a 162-game grind coming down to one, nine-inning affair doesn’t seem right. Things seem so wide-open that there might even be a glimmer of hope for the New York Yankees, just two weeks after they seemingly blew the whole thing up. Truth be told, the Yankees are all but dead in 2016, but the fact that they are just 4.5 games back should tell you that the field has been anything but clearly defined. There is a strong chance that both wild card spots come out of the American League East. Following their massive, six-run comeback in San Francisco, the Orioles remain just a half-game back of the first-place Blue Jays. However, they are just 1.5 games ahead of the Boston Red Sox. In that second spot, the Red Sox’s lead is anything but secure. The Detroit Tigers are 17-11 since the All-Star break and trail by just 1.5 games, while the Mariners are even hotter, having won 11 of their last 15 to pull within two games. And Houston is four back despite going 7-13 over its last 20 games. If I had to make a prediction, I would venture that both wild card spots will in fact come out of the East. That would make for quite an exciting, offensively-charged one-game playoff involving some combination of the Jays, O’s, and Sox. The Tigers would fit into that mold as well should they get in, and the Mariners would be an interesting draw. It is remarkable that the Dodgers have gone 24-16 since Clayton Kershaw was shut down after his June 26 start. They are just one game behind the San Francisco Giants in the National League West due to the fact that the G-Men are an MLB-worst 9-18 since the break. What it means is that it’s very likely that the loser of the NL West race will host the wild card game as the higher seed. But what about the rest? Right now, it’s looking very possible that we’ll have yet another Cardinals-Dodgers or Cardinals-Giants October showdown. That would bode well for TV ratings, as these are the National League’s premier teams of late and have had epic playoff battles. What’s interesting is that despite an unspectacular 62-56 record, the Cardinals are baseball’s best road team at 34-23 away from Busch Stadium. So traveling out west won’t faze them the way it might faze the Marlins, Pittsburgh Pirates, or even the defending NL-champion New York Mets. St. Louis simply can’t be counted out. It possesses the most potent offense in the National League and plenty of pedigree, having won four pennants since 2004 and battling through a long list of injuries. But the scary thing about a matchup with the Marlins can be summed up in two words: Jose Fernandez. As we’ve seen, this one-game playoff business can very well hinge on a hot pitcher (see: Jake Arrieta and Dallas Keuchel, 2015). Miami may be without Giancarlo Stanton, but Fernandez is an elite pitcher with the ability to completely neutralize a strong offense like that of the Cardinals or Dodgers. There’s also this guy named Noah Syndergaard who can hold his own, pitching for a Mets team that went 7-2 in the National League playoffs in 2015. Despite their offensive struggles in 2016, that’s not an enjoyable matchup, either. The Mets are 2.5 games out, while a team you aren’t hearing much about is 1.5 games back. That would be the team that has hosted the last three of these, the Pittsburgh Pirates. Gerrit Cole hasn’t looked like an ace, and now the closer, Mark Melancon, is in DC. But don’t sleep on the Buccos, who have a young, talented lineup and a deeper bullpen than people think. The odds are against them, but they will fight until the end. If I had to make a prediction here, the Cardinals will somehow find a way despite all the injuries and the league will get its Cards-Dodgers or Cards-Giants battle. Be the first to comment on "MLB Week 19 Roundup: Wild wild card races, and the sanctity of the second spot"